Bagus Jati Wellbeing Retreat is a small destination spa located in the tropical mountains of Bali, about an hour’s drive from Ubud. Bagus Jati was created with a vision to bring health and vitality into life. 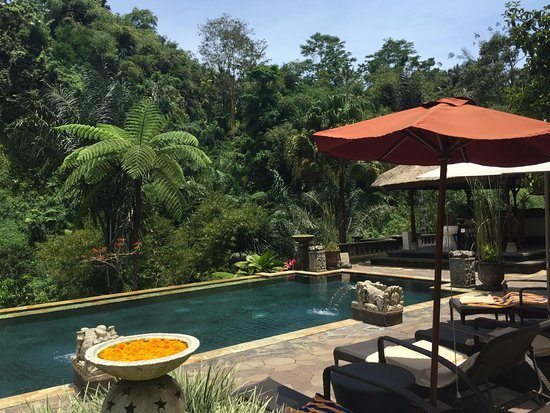 Set in 5 hectares of hillside gardens amongst lush tropical forests, Bagus Jati provides beautiful views of mountains, valleys and tropical flora and fauna. It offers a global palate of world class health and wellbeing activities and programs such as : nutrition, detox, yoga, meditation, Ayurveda, stress relief, anti-ageing, weight loss, nature trekking and healthy cooking workshops. It also boasts a world class spa with each individual villa comprising of its own private water garden or views over the jungle valley and an intoxicating range of healing treatments. Accommodation consists of eight deluxe spa villas, each with private spa facilities and ten 10 superior villas with wide windows overlooking the tropical forest. Verandas on both the Deluxe and Superior villas provide an excellent setting for a romantic dinner or just relaxing on the day bed. Bagus Jati was founded to preserve the timeless wisdom of traditional Indonesian and Balinese healing. All products used in the spa are based on the healing properties of Indonesian jamu and use indigenous ingredients to refresh and rejuvenate. Therapists from surrounding villages are trained to guide guests on a journey that may well include Ayurveda, acupuncture, hydrotherapy, life enhancement and detoxification programs. Throughout the year a variety of retreats are offered to give guests an opportunity to reflect and transform.